Get Involved/ - YARMOUTH PORT LIBRARY... WHERE YOU FIND MORE THAN JUST BOOKS FOR READERS YOUNG AND OLD! The Yarmouth Port Library is a privately funded public library. Library services are funded by your membership contributions and donations. 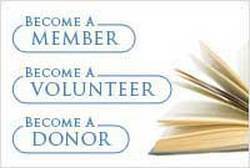 Please consider getting involved by becoming a member of the Yarmouth Port Library Association, volunteering your time, or making a financial contribution. Once Again, It’s Membership Time! Memberships in the Yarmouth Port Library are an important source of operating funds, providing about 25% of our operating budget and bridging the gap between our costs and other sources of operating revenue. As last year, our goal is $40,000. For 2018, we ask our patrons to subscribe at what for them will be a sustainable level. If all of our current members maintain or increase the level of their 2017 membership gifts, their contributions, together with those of new members, will allow us to meet our objective. In considering your membership renewal, we hope you will think about what the Yarmouth Port Library means to you and to the community at large—and what Yarmouth Port would be without it. Please be as generous as you can. For anyone who for some reason does not receive membership materials in the mail, you may pick up information at the library. Note: Current memberships expire on December 31, 2018, but anyone who has joined after June 30, 2018 is enrolled as a member through December 31, 2019. If you are uncertain about your current membership status, please call Membership Committee Chairman Les Peat at 508-362-7660 to avoid a double payment. Click here for the Yarmouth Port Library Association Membership Form, or call the library at 508.362.3717 for more information. There are often opportunities to volunteer at the library: Genealogy Room and Archives Assistant, general library assistance (processing, organizing and shelving materials), and for special projects or one-time events. For more information stop by the library to pick up a volunteer application, contact the library at 508.362.3717, or email us at yarp_mail@clamsnet.org. As a privately funded public library, the Yarmouth Port Library does not receive funding from the Town of Yarmouth. The Yarmouth Port Library Association raises funds through private donations, grants, bequests, and other gifts. Your donations provide the operating funds we need to stay open today and in the future. Please consult with your lawyer or financial adviser before donating.